AWS certification training will provide you with the right knowledge of AWS cloud for clearing AWS certification. You will get real time hands-on experience in working with cloud computing, Amazon Web Services, various components of cloud like Software as a Service, Platform as a Service, Infrastructure as a Service and private cloud programming. You will learn to design, plan and scale AWS infrastructure using the best practices. This AWS certification training course will make you exam-ready for the AWS Solution Architect Associate certification and will enable you to leverage your skills and expertise involving advanced cloud-based solutions, and migrating existing workloads to the cloud. AWS Architect Certification Training is curated by industry professionals as per the industry requirements & demands. AWS training in Bangalore will help you to pass the AWS Certified Solutions Architect (CSA) – Associate Exam. AWS Architect training encompasses the comprehensive knowledge on Cloud Computing and its various services such as Lambda, S3, EC2, VPC, Redshift, IAM, EBS, Cloudfront, Snowball, Cloudwatch, DynamoDb, Glacier, SES, SNS. AWS Certifications Training have evolved rapidly over the last few years. There are now 5 certifications available at both associate and professional level with re-certification required every two years. Two more exams have recently been announced and will be 'coming soon': a Security Operations on AWS certification and a Big Data on AWS certification. Certification is a matter of demonstrating your skills and establishing your credibility. Achieving credentials could open doors to get heavily involved in AWS-related projects, or present to clients as a credible subject-matter expert. Of course, if you're job-hunting, just having 'AWS Certified' on your CV won't get you hired, but it could help you get you past various gatekeepers and into an interview room. Businesses don’t always have an easy way of testing the competencies of a job applicant. Also, they may be sifting through tones of CVs, so having the certification certainly gets you the wanted attention. An extra bonus is the swag you receive from AWS Summits and conferences, although I'm not sure I can justify that as a reason to get certified. Having AWS-certified employees helps to identify skilled team members and reduce the risks when implementing projects on AWS. Having AWS-certified employees can also help you to build your business, as it is one of the criteria for the higher tiers of membership in AWS Partner Network (APN). Being a member of the APN gives access to a wide variety of benefits, including training subsidies, AWS usage credits, marketing support and much more. View the APN website for more details. 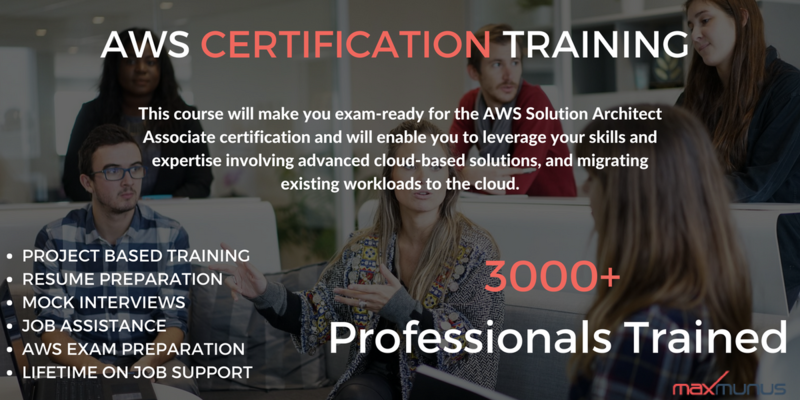 We're already seeing a large number of delegates on AWS Training Courses who are planning to take the AWS certification exams as part of their employer's APN accreditation. Having AWS-certified employees helps to identify skilled team members and reduce the risks when implementing projects on AWS. Having AWS-certified employees can also help you to build your business, as it is one of the criteria for the higher tiers of membership in AWS Partner Network (APN). Being a member of the APN gives access to a wide variety of benefits, including training subsidies, AWS usage credits, marketing support and much more. AWS Certification Training have a recertification policy for the AWS Architect Associate certification, stating it can be renewed by either passing a shorter, cheaper version of the original exam, or by upgrading to the higher-level Professional certification. Either way seems appealing when it comes to the end result of being accredited in the constant changing IT landscape.